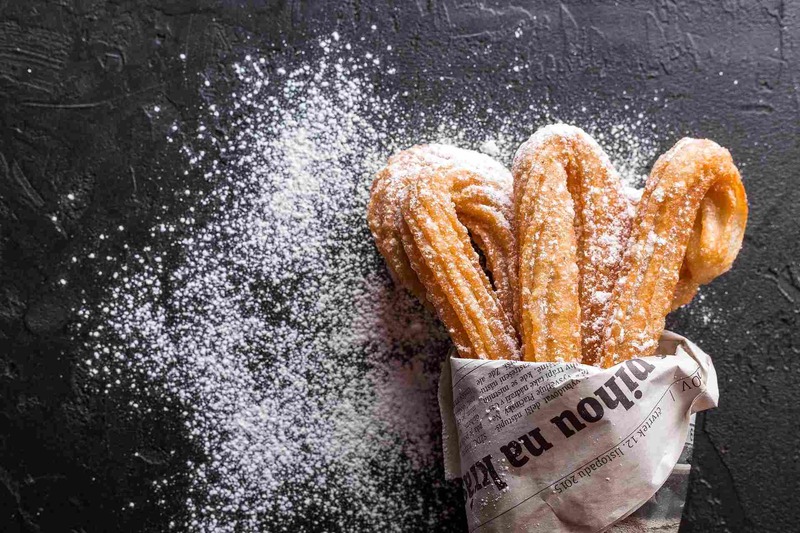 Churros – YUM! Traditionally served for breakfast in Spain, they have become popular around the world as a sweet snack to be enjoyed at any time of the day. Whisk together the water, salt, sugar, and olive oil in a small saucepan over medium heat. Bring the mixture to a boil then remove it from the heat. Stir in the flour while mixing with a wooden spoon until it forms a ball. Squeeze a 5-6 inch strip of dough into the hot oil. Repeat, frying 3 or 4 strips at a time. Fry the churros, turning them once, until golden brown and crisp, about 2 minutes per side. Transfer the cooked churros to a plate lined with paper towels to drain. Gently melt the dark chocolate in a double saucepan. Transfer to a bowl and serve with the churros. Non vego option: serve with milk chocolate or a sauce made of cream and chocolate. Storage: ideally eaten on the same day, but will can be stored in an air tight container in the cupboard.